Prototype: Swiss Federal Railways (SBB) class Fc 2x3/4 "Köfferli" / "Little Suitcase" electric freight locomotive (later class Ce 6/8 I). Version when it was first delivered. Dark brown basic paint scheme with black running gear. With older design buffers, cab doors without windows at the ends of the locomotive, and with walkover plates, with sanding equipment, without an oncoming train light, and without an inductive magnet. Road number 12201. The locomotive looks as it did at the middle to the end of 1919. Model: The locomotive has a digital decoder and extensive sound and light functions. It also has controlled high-efficiency propulsion with a flywheel, centrally mounted. 3 axles and jackshaft powered in each truck by cardan shafts. Traction tires. The locomotive frame is articulated to enable the locomotive to negotiate sharp curves. Triple headlights and 1 white marker light (Swiss headlight / marker light code) change over with the direction of travel, will work in conventional operation, and can be controlled digitally. When the locomotive is running "light" the lighting can be changed to 1 red marker light. The headlights at Locomotive Ends 2 and 1 can be turned off separately in digital operation. The locomotive has the double "A" light function. The cab lighting and engine room lighting can be turned off separately in digital operation. Maintenance-free warm white and red LEDs are used for the lighting. 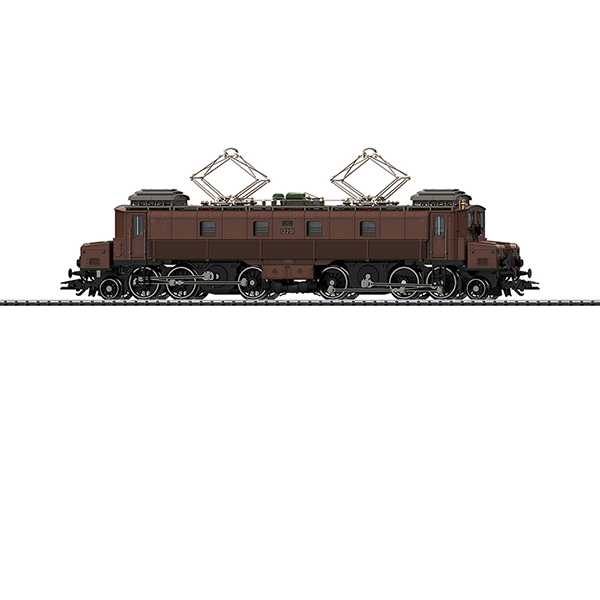 This locomotive is highly detailed metal construction with many separately applied details, such as cooling pipes for the transformer oil. The cabs and engine room are modelled. Sanding equipment is included on the groups of driving wheels. The roof equipment is detailed with heating resistors, roof conductors, insulators, and roof walk boards as well as double-arm pantographs with a simple contact strip. The minimum radius for operation is 360 mm / 14-3/16". Brake hoses, imitations of prototype couplers, and access ladders are included. Length over the buffers 22.1 cm / 8-11/16". Digital decoder and a wide variety of operation and sound functions included. 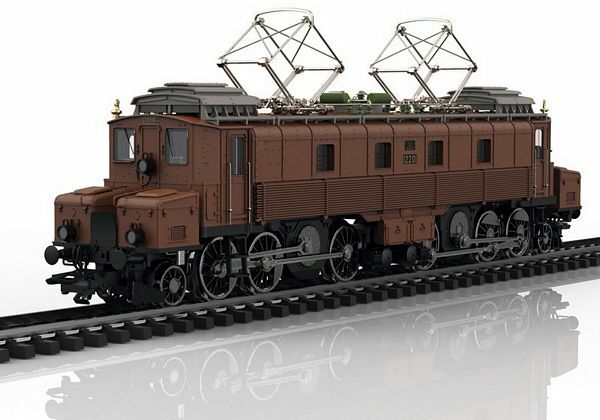 A freight car set to go with this locomotive can be found under item number 46520 in the Märklin H0 assortment along with information about the required DC wheel sets. This model can be found in an AC version in the Märklin H0 assortment under item number 39520.